If you are a fan of fried mozzarella sticks (is anyone not?) then you are going to love to today’s recipe…a fantastic, easy, and oh so yummy Baked Cheese Balls Recipe! I recently came across the original version of these Baked Cheese Balls at Never Trust a Skinny Cook, and then made a few changes to make them lower in Weight Watchers Points. They were SO good! And the fact that they were little balls rather than sticks, made me feel like I was getting a lot, which I love. I made these while my kids were napping, and then sat down on the couch for 15 minutes of glorious, uninterrupted, cheesy bliss, while I indulged. Just 5 Points for the whole recipe makes these Baked Cheese Balls a fantastic Weight Watchers snack idea for the fried food lover. These are also a great idea for a tasty, yet healthy Super Bowl Recipe, so make sure to keep this recipe on file for game day. Enjoy! A healthier alternative to fried mozzarella sticks, these Baked Cheese Balls are the perfect fried food fix. 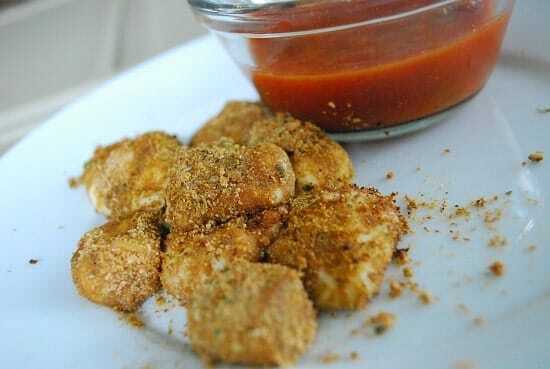 They are not only and incredibly easy snack recipe, they are delicious, cheesy, and just 5 Points for the whole dish. Preheat oven to 425 degrees and line a baking sheet with aluminum foil. Spray lightly with non-fat cooking spray or with an olive oil mister. Cut up cheese sticks into bite sized pieces. In a blender or food processer, combine cereal, garlic powder, salt, parsley and oregano until they have a reached a breadcrumb like consistency. Empty into a small bowl or a Ziploc bag. Dip cheese bites into egg whites, shake off excess, and then coat with Fiber One breadcrumb mixture. Place coated cheese balls onto baking sheet and very gently mist with olive oil or non-fat cooking spray. Bake for about 5-7 min, or until cheese begins to soften, but doesn’t melt into a puddle. Let stand one minute and then enjoy! *To avoid your cheese balls from melting into a puddle, watch closely when cooking and remove from oven just when balls are softened, and just starting to ooze. Also, Never Trust a Skinny Cook recommended freezing the cheese balls before baking and/or using fat free string cheese. just made these with a few tweaks…bread crumbs instead of fiber one and colby-jack cheese since we didn’t have the cereal or mozzarella on hand. less healthy, yes, but still very good. thanks! I can’t wait to try these :) What kind of marinara did you use to dip and how many additional points is that? I used Trader Joe’s Organic Tomato Basil Marinara Sauce. I only used about 1/4 cup, and I think that came out to one additional Point. sounds so good, I’m going to try it. Thx. I did this using another blog’s recipe (basically the same but with bread crumbs) and mine totally melted in the oven and got flat. How does everyone avoid that from happening? Can you advise if the Weight Watcher points decrease if we use Fat Free Cheese, and if so, how many points per ball would they be? Thanks so much for all your Wonderful recipes! I don’t know the exact nutritional of the fat free cheese, but I’d guess that the overall PointsPlus would decrease by maybe 1 Point for the total recipe. As for the Points per ball, I cut my cheese into 5 pieces per string, and I used 2 strings. So using the reduced fat cheese, I got 10 balls for 5 Points +. Hope that helps! And thanks for reading!